Enchantment Resort is one of our featured luxury resorts. Enchantment has received great reviews online and has received a number of awards and accolades. It's a great place to relax and unwind. Fantastic spa too! 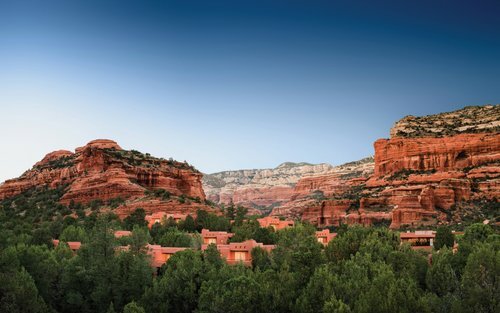 A highlight of Enchantment is that it's surrounded by beautiful red rock formations. You'll find it in Boynton Canyon, Sedona, Northern Arizona. It's 110 miles north of Phoenix. 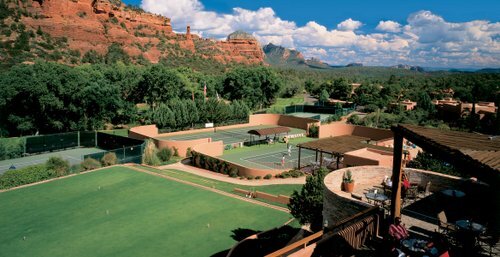 Loved among tennis buffs, Enchantment has tennis programs, private lessons and tennis workshops. There are 7 outdoor tennis courts. Other activities include self hiking, swimming, outdoor whirlpools, mountain bike rentals, par-3 golf course and putting green, croquet, Camp Coyote Children's program. 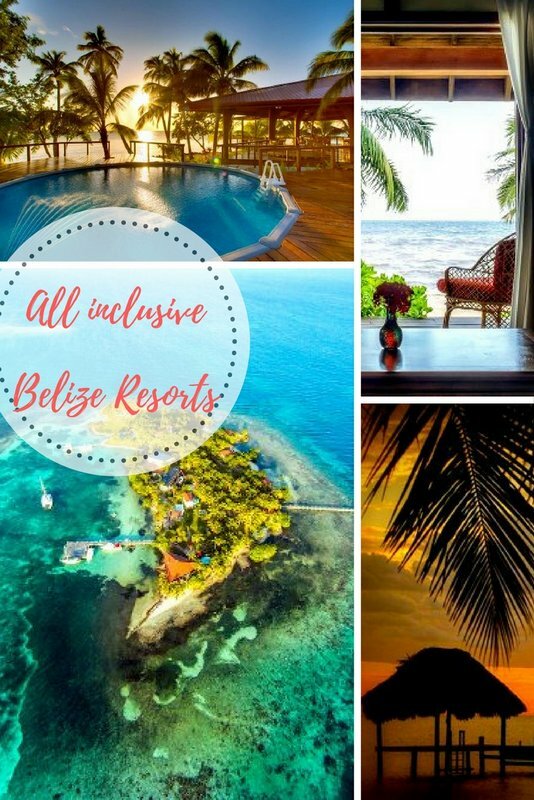 Check the resort website for special activities also. At times they have things like a Native American Cultural Program running. There are Adobe Casista-Style accommodations at Enchantment. They are decorated in Southwestern style. Every room has an outdoor deck from which you can view the canyon. Casa Suites - Highlights: 1 or 2 king bedrooms, fireplace, soaking tub, kitchen, oversized living room. Haciendas - Highlights: King and/or Queen bedrooms (1 or 2), adjoining studio, living room, fireplace, kitchen (seats 6), gas grill outside on deck. Casistas - Highlights: King/Queen bedrooms (with private bath), living room, fireplace, kitchenette, gas grill outside on deck. Variations: 1 or 2 bedrooms (with or without private pool), Casista studio, Casista bedroom. Junior Suites - Highlights: bedroom, living area, fireplace, granite desk, oversized bathroom with soaking tub. 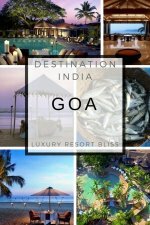 You'll find 3 restaurants at the resort. The 4 Diamond Rated Yavapai Restaurant, the Tii Gavo casual restaurant and the Mii Amo Cafe. 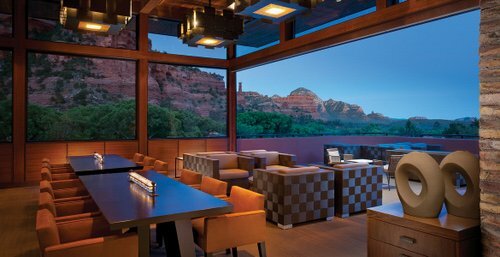 You can also eat well in Sedona. 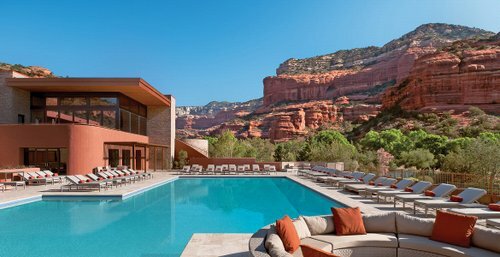 Lovely property, great but very expensive, bathroom was huge, gorgeous red rock views almost every direction, fabulous spa, customer service was superb, very friendly and warm staff, very comfortable beds, spa is A+. Click here for more information, prices and to check availability.